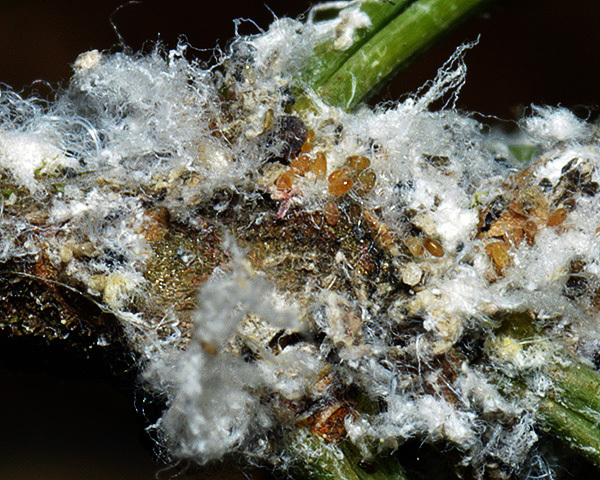 The aptera of Pineus strobi is dark brown or dark red, and is covered in dense white wax wool. The head-prothoracic shield is heavily sclerotized. The wax gland facets have polygonal lumina, similar in type to Pineus pineoides, but are generally more numerous, occurring in large groups over the shield. The adult body length is 0.75 - 0.9 mm and width is 0.6 - 0.8 mm. The eggs laid by the apterae measure between 0.26 and 0.28 mm long. 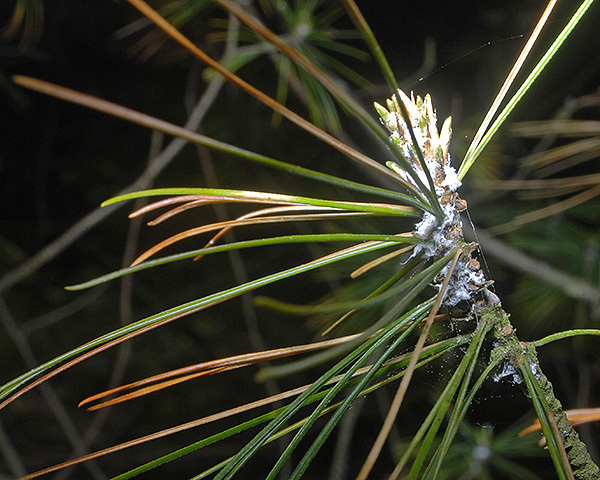 The first picture below shows a dense colony of Pineus strobi on a branch of Pinus strobus - the live adelgids are obscured by the white wax 'wool', but some of the large orange-yellow eggs of Pineus strobi are visible. The alate sexupara (see second picture above) is deep red. It is larger, but otherwise resembles the sexupara of Pineus pini. Alatae of Pineus strobi have the rhinarium on antennal segment V very large, more than half the segment length, with its basal portion about the same length as its terminal portion. Antennal segment III has a circular rhinarium when seen ventrally (cf. 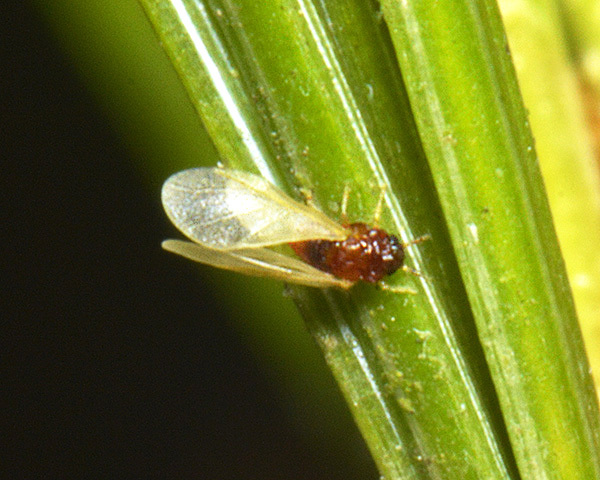 alate Pineus pini which have the rhinarium on antennal segment V less than half the segment length, and the basal portion of rhinarium clearly longer than terminal portion. Antennal segment III has a rhinarium that is broad and angular). The usual host of Pineus strobi is eastern white pine (Pinus strobi), but where introduced it has also been recorded on Pinus cembra, Pinus pinea, Pinus sibirica and Pinus sylvestris. It is an anholocyclic 'species', so does not host alternate. Overlapping generations of sistentes and progredientes feed through the spring and summer on shaded parts of the trunk and undersides of the branches. The pine bark adelgid is native to North America, but has been introduced to Europe, and has also been recorded from western Siberia. We have only found the pine bark adelgid on one occasion - on Weymouth pine, Pinus strobus, at Bedgebury Pinetum in Kent (see picture below). 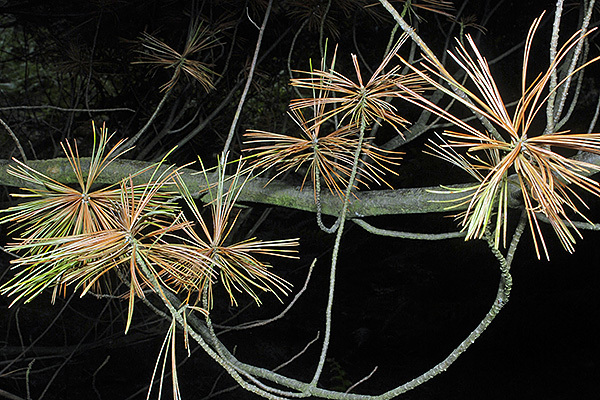 Weymouth pine is native to eastern North America where it is known as eastern white pine. It was named Weymouth pine in Britain because Captain George Weymouth of the Royal Navy brought its seeds to England from Maine in 1605 (Little, 1980). 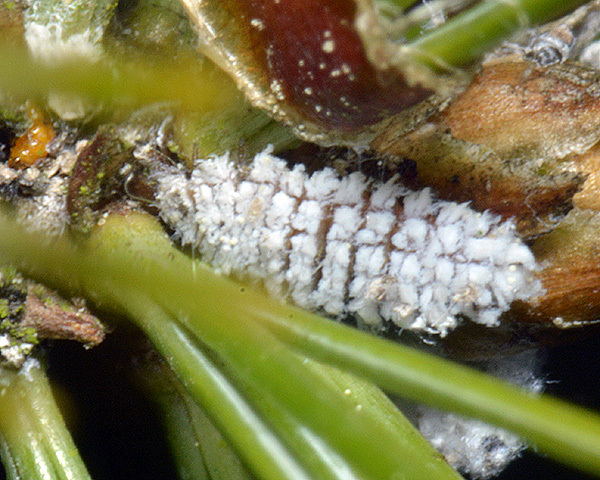 Presumably at some time in the last 400 years some seedlings infested with the pine bark adelgid (Pineus strobi) were also brought from North America to Europe, thus introducing this adelgid to the many trees grown for ornamental purposes in Britain. At Bedgebury several of the needle clusters on one tree had dense woolly aphid colonies of Pineus strobi (see picture below). Pineus strobi is more likely to reach pest numbers in countries outside of the USA where the natural predators are not found. However, interestingly the colony at Bedgebury was being predated by another specialized predator, a 'woolly' coccinellid larva of the genus Scymnus (see pictures below). We cannot be certain of the species, but Scymnus nigrinus is a known predator in Europe of aphids and adelgids on pine (Vohland, 1996). 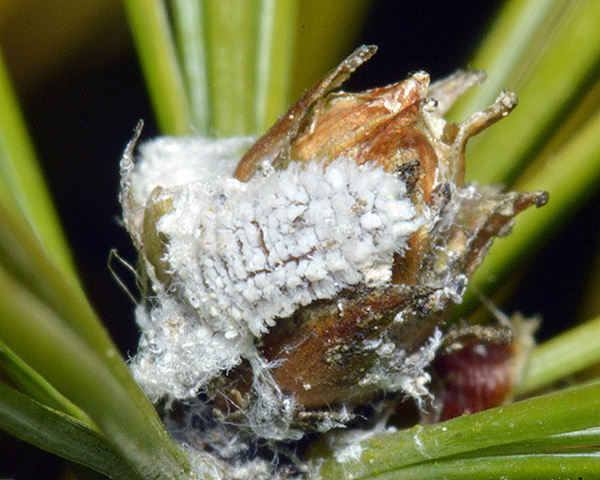 The wax clearly provides very good camouflage for the coccinellid larva amongst the adelgid colony, thus providing protection from bird predators. Whilst its primary host is unresolved, in USA Pineus strobi sexuparae sometimes fly to Picea mariana (Black Spruce) to lay eggs on the needles. No gallicolae (or their galls) have been found on Picea mariana (or any other spruce) - either because the oviparae fail to develop or there are no males available. Pineus strobi has been recorded from 9 Pinus species Pinus aristata, Pinus cembra, Pinus monticola, Pinus peuce, Pinus pinea, Pinus sibirica, Pinus strobus, Pinus sylvestris, Pinus wallichiana). Blackman & Eastop list 18 species of aphid as feeding on Eastern white pine, Weymouth pine (Pinus strobus) worldwide, and provide formal identification keys. Of those aphid species, Baker (2015) lists 5 as occurring in Britain: Cinara pinea, Essigella californica, Eulachnus rileyi, Pineus pini and Pineus strobi. Little, E.L. (1980). Eastern White Pine. National Audubon Society Field Guide to North American Trees: Eastern Region. Alfred A. Knopf, New York.